I make this dish every so often, when I want a great breakfast dish, but doesn't require a lot of work or time. It's fairly hands-off when it comes to the effort put into this dish, but is a great payoff in how delicious it is! 2. Set oven temperature to 400 degrees while the potatoes are cooking. 3. Turn off the burner, and sprinkle the cheese over the potatoes, and let melt for a minute or so. Then, crack eggs onto the potatoes, being sure to spread them out so they cover the whole pan. 5. 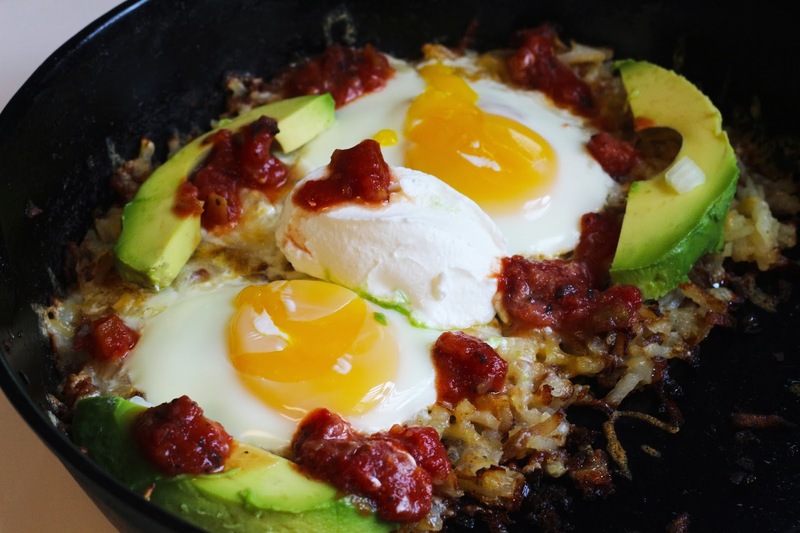 Remove pan from oven, and top hash browns with sliced avocado, salsa, and sour cream. Use a spatula to remove from pan and serve!